Warren Buffett isn't nervous about a stock market bubble. The legendary investor thinks anyone betting against America is "out of their mind." 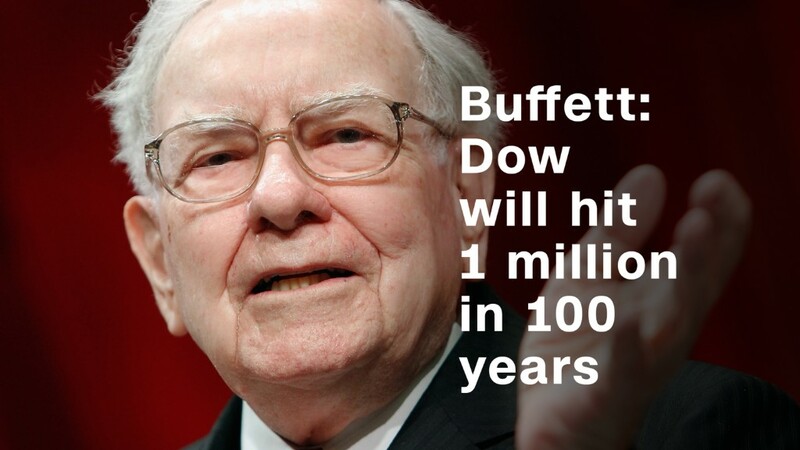 Buffett, a reliable optimist about the future of the U.S., predicted on Tuesday night that the Dow Jones Industrial Average will be "over 1 million" in 100 years. That would be roughly 45 times the Dow's current level of nearly 22,400, which is already a record high. 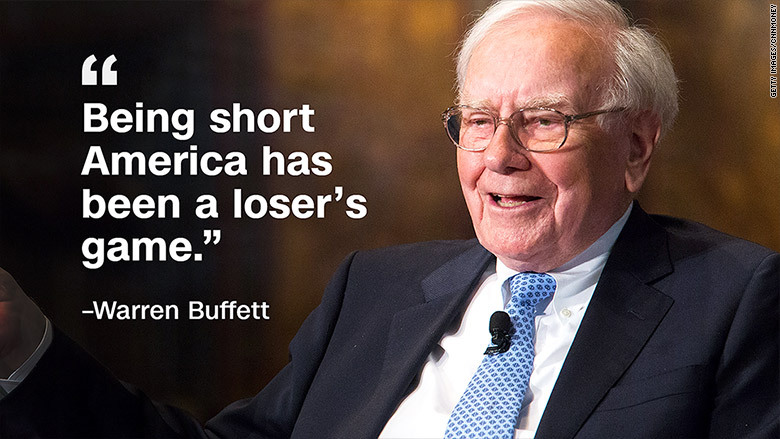 "Being short America has been a loser's game. I predict to you it will continue to be a loser's game," the Berkshire Hathaway chairman said. Buffett was speaking at a New York event commemorating the 100th anniversary of Forbes magazine. His comments were previously reported by Reuters. Buffett, whose fortune Forbes pegs at $78 billion, realizes he won't be around to see if his Dow prediction comes true. The 87-year-old billionaire said he gets "excited" just when people talk about him making it to 100. So is Buffett's Dow 1 million call just crazy talk? Maybe not. Keep in mind that the Dow was sitting at just 81 a century ago. It's now valued at nearly 300 times that level, as the U.S. has developed into the world's most powerful economy and its only superpower. 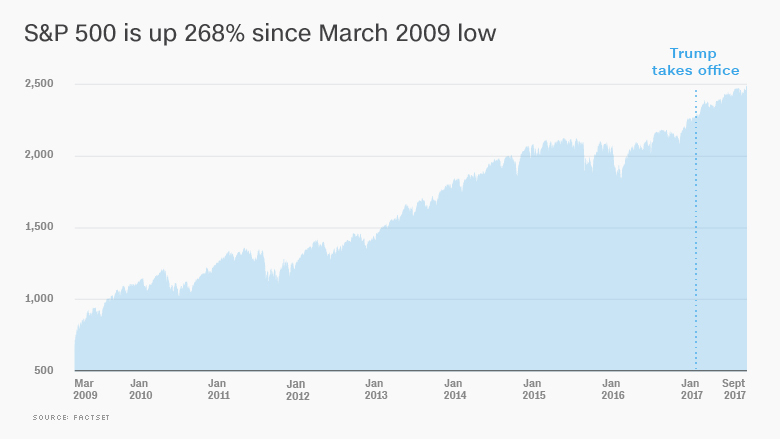 To get to 1 million, the Dow would have to skyrocket 4,500% from here. But it would have 100 years to get there. The compound annual return would only need to be 3.87%. That sounds doable considering that the Dow sported a 10.7% rate of return between the end of 2008 and last year. "That is not a ridiculous forecast at all, if you do the math on it," Buffett said. "It's an amazing country we live in." Of course, a lot could go wrong along the way. Some worry about the threat of a conflict with North Korea, while others are concerned about trade wars and the rise of populism. Mike Bloomberg, the billionaire former mayor of New York City, worries the economy faces real challenges from crumbling infrastructure, job-destroying technology and difficult immigration policies. "I cannot for the life of me understand why the market keeps going up," Bloomberg told CBS on Tuesday. What's certain is that at some point, the bull market in stocks, already the 2nd most powerful in history, will end. Skeptics fear that end will be very painful, because stocks have been pumped up to enormous heights by extraordinary stimulus from the Federal Reserve. Julian Robertson, another billionaire investor, warned last week that the Fed is "creating a bubble" in stocks by being slow to raise interest rates from emergency levels leftover from the 2008 financial meltdown. Buffett, on the other hand, has a long history of being optimistic on America, even when things look bleak. Recall the $5 billion lifeline he provided to Goldman Sachs (GS) during the financial crisis. That bet represented a vote of confidence in Goldman at a time of great fear. And its generous terms eventually made Buffett billions. Savvy investments like that are why Buffett ranks No. 2 on the Forbes list of the richest people in the U.S. Buffett noted that over the years, about 1,500 different people have made the Forbes list of richest Americans. Some are entrepreneurs, others made their money in real estate or the stock market. "But the one thing you don't see in those 1,500 names: you don't see any short sellers," Buffett said.